Marshall joined BEF in June of 2014. Prior to joining the team, Marshall helped run the Southtown Housing Community After School program with members of the Southtown community in Birmingham. 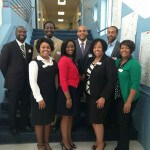 This experience gave him a desire to teach and resulted in his move to Washington, DC to teach 1st, 3rd & 5th grade. Marshall and his wife returned to Birmingham in 2013 where he served as a Manager of Teacher Leadership Development with Teach For America. He supported teachers in Birmingham City Schools, Tuscaloosa City Schools and Sumter County schools. Now as a member of BEF, Marshall is responsible for supporting the Raise Up! Initiatives including Network Night, and the Network Connector Fellowship. His wife is a teacher at Avondale Elementary and they live in the Avondale/Woodlawn community.